With word trickling out of Washington that President Obama will focus tomorrow's State of the Union address on the economy and job creation, it's a good time to look at how the recovery is proceeding in housing markets across metro areas. Since the collapse of the housing bubble, employment in the construction sector has fallen dramatically across the nation, even relative to the economy as a whole. While jobs are being added in other industries, the construction sector has continued to lag, holding back a more vigorous recovery. Will construction ever come back? Nationwide, overall employment was down 3.4 percent between September 2006 and 2011, while construction was down 27.7 percent. Over the past year, national construction employment rose only 0.9 percent while overall employment grew 1.6 percent. But not all the news is bad for construction: in some of the hardest hit metros, a stronger recovery may already be underway. Take California metro areas for example. As the table below shows, construction employment was hit harder here than in most other areas. 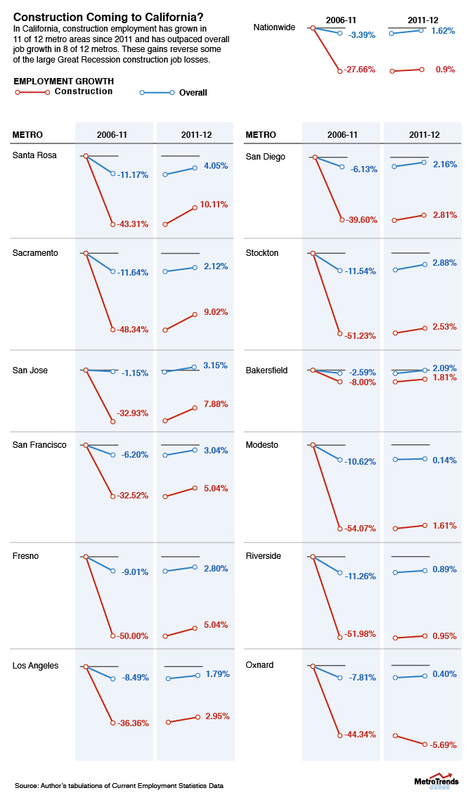 But the past year suggests things are on the upswing in many of the state’s metros. Construction employment has grown in 11 of 12 metro areas and has outpaced overall job growth in 8 of 12 metros. This means that construction’s share of total employment is also recovering. In San Jose, construction job growth was 7.9 percent, stronger than its overall job growth rate of 3.2 percent. Obviously, construction has a long way to go, and it shouldn't even be a goal to return to bubble levels of employment in that sector. As the figures show, Oxnard may not be a place where new homes are built for a long time. But it is comforting to know that a more robust recovery may soon be on the way. The question isn’t just when, but where.